Hard to believe that Semantica Records has been in business for a decade and even the previous milestone with the “Five Years Compilation” series feels like a recent event. Over the time, the label boss Svreca has managed to keep the touch despite of extensive catalogue and has attracted a stellar roster, virtually a Who’s Who of today’s techno. The label from Madrid has also played a major role for a minor thing called Terminal 313, because Svreca was among the very first label owners and artists who trusted my fledgling blog and shared information about the coming releases. Regular Terminal 313 readers are aware of frequent posts about Semantica vinyls and I can affirm most of them were well justified due to the label’s high standards. 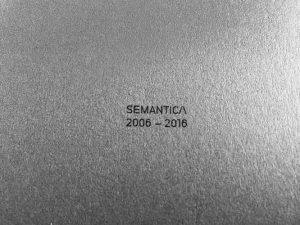 To celebrate the tenth birthday, Semantica has launched the sampler series “10”, where the first gathering of the international techno community featured Donato Dozzy‘s immersive hypnosis (“Rotary 3”), laid back IDM-ish tune by Mod21 (“The Smell Of Sand”), Stanislav Tolakachev‘s exalted and crisp minimalist dash (“Stockholm Syndrome”) and for the end, DJ Skirt delivered a gift to the drone totem (“Angracia”). The second instalment is even more focused on the floor, kicking off with Jonas Kopp‘s raw and tinny banger (“Sonic Quest”) and then Cassegrain is chasing ghosts in the wilderness in “Decagon”. On the B-side, Acronym‘s “The Inevitable” opens with Geophone-reminiscent textures, before switching to the Harthouse trance frequency, followed by abstract-ish offbeat cut “Storm” by Doka. When adding “Gajeree”, Von Grall‘s label debut with nautical and grainy loops in Polar Inertia / Abdulla Rashim style, there is no doubt that Semantica remains in techno’s forefront.